Listen, the Pitch Perfect trilogy is the greatest three-part film saga ever made. Don’t @ us. Although the Barden Bellas are no longer in our lives, learning that the stars of Pitch Perfect are basically sisters IRL is such a source of joy, we can’t even deal. A group of Bellas organized a mini Pitch Perfect reunion in honor of Chrissie Fit’s birthday. Fit played Flo, and yes, we recognize that anyone who wasn’t Anna Kendrick/Brittany Snow/Rebel Wilson is slightly more difficult to place, but true Pitches remember our girl Flo. 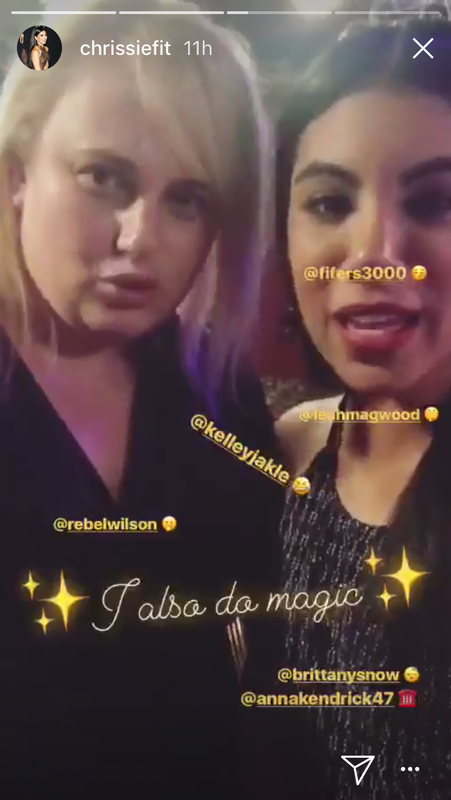 The Bellas got the band back together yet again and celebrated Fit’s birthday at the Magic Castle in Los Angeles, which is literally a castle in L.A. where magicians hang out and do magic shows. Who was there, you ask? The aforementioned Kendrick, Wilson, Snow, Fit, and Kelley Jakle. Remember in Pitch Perfect 3 when they would cut away to those two random girls who jokingly never had any lines? Kelley Jakle was one of those girls without any lines! According to Wilson’s Instagram, the birthday was a surprise, which makes our hearts melt even more just imagining these secret Pitch Perfect group chats. Watching Pitch Perfect feels like hanging out with all your besties, probably because all your besties are legit friends IRL. Back in December 2017, Kendrick told People for The Jess Cagle Interview that she would do more Pitch Perfect films if she could. As long as the Bellas keep serving up reunion social media content, we’re good.